New virtual reality app. Celebrating their 100 year history, retail giants Spar and Blakemore Trade Partners present a concept ‘Store of the Future’. This fully 3D rendered VR tour shows a glimpse of the future, transporting you forward in time. Spar VR has been delivered by the innovative designers and coders at Gooii Nottingham, with all design, 3D modelling and coding completed entirely in-house. 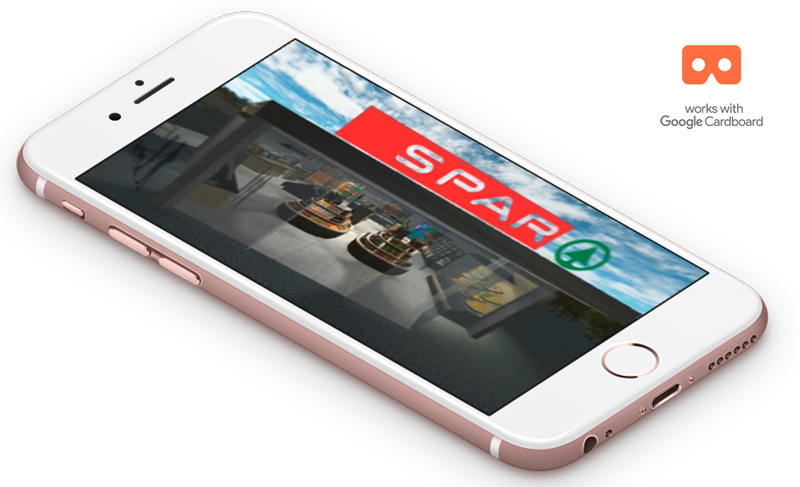 With drones flying overhead, holographic ordering points and displays, ‘Spar VR’ enables users to experience Spar’s vision years before it becomes a reality using Google Cardboard VR compatible virtual reality headsets and their phones. The app is currently available on the Android app store with iOS coming soon. You can also view Spar VR on any compatible device via YouTube. This includes iOS, Android and desktop (Chrome Browser required for desktop viewing). Download from the Android Store or view on YouTube.